The Government is providing funding of £150 million+ per annum for academic years 2013/14, 2014/15, 2015/16 , 2016/17 and 2017/18 to provide new, substantial primary school sport funding.This funding is being jointly provided by the Departments for Education, Health and Culture, Media and Sport, and will see money going directly to primary school headteachers to spend on improving the quality of sport and PE for all their children. How will we be spending the Sport Premium? We are currently one of the minority of schools in the county which hold the ‘Norfolk High Quality PE’ award. This includes significant external validification about the quality of learning and teaching within the school PE curriculum. We have two specialist PE teaching staff, including an HLTA who holds the Norfolk NPECTS PE teaching award. School has attained the National High Quality PE Award with distinction- one of first schools in county to do so- see application for range of evidence. PE premium money supported staff professional development to achieve this award. Pupil voice sample survey (Sept’14 , Jan’16, Feb’17, Nov’17) was very positive about new sports tried eg korfball and handball, and sessions were all observed by school staff to enable legacy. Lesson plans and resources were kept. Data also suggests that there are high levels of pupil participation in sport both inside and outside school. PE staff have continued to receive appropriate professional development opportunities- see PD log and have worked alongside other staff to develop and broaden skills eg Olympic dance showcase event for Y2. 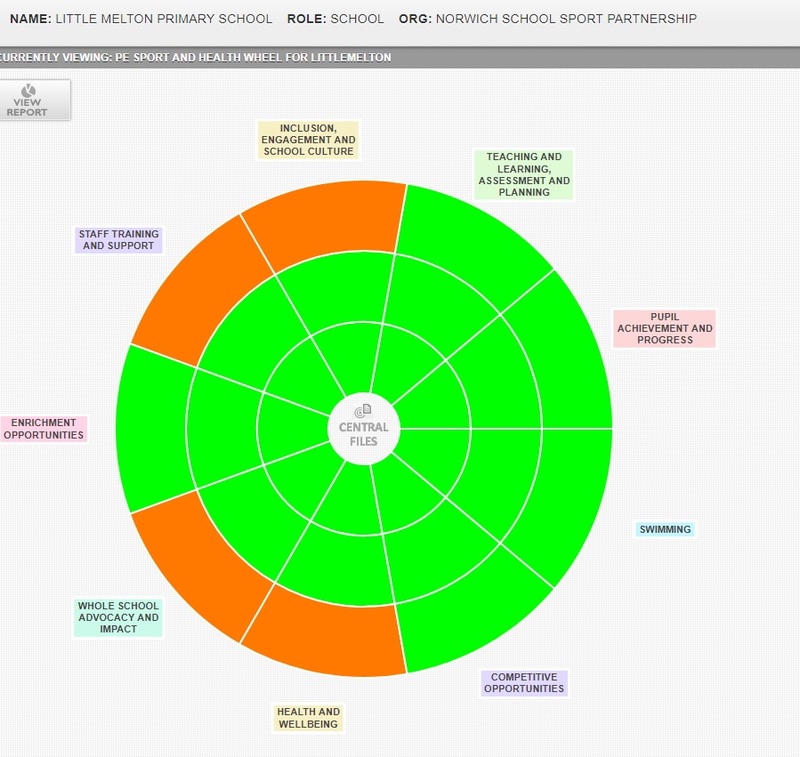 School sports partnership membership enabled a wider range of sporting opportunities than before- see log of events entered. All children in the school represented the school in at least two inter-school events last year. Before School Change for Life club was attended by children targeted for intervention to promote Healthy Eating, and will be repeated to consolidate learning in November ’14- see registers of attendance for Before School Club. Curriculum element ‘Keeping Safe and Healthy’ includes clear teaching of healthy eating, and displays have been created in the school hall to support this. How will the improvements be sustainable in the future? All visiting coaches are observed teaching by LMPS staff, and lesson plans acquired. Resources have also been subsequently purchased to allow staff here to deliver the activities in the future. PD investments in staff have been disseminated widely amongst all teaching staff to promote good practice. Team teaching has also been used to allow the most experienced teachers to model effective approaches. Cost effective models of promoting interschool sport have been discussed and implemented both through the Norwich SSP, and also the Hethersett PE cluster network.